At 8:00 a.m. on a Sunday, the big fat truth finally dawned on me. Seated in the dank basement of a dubious weight-loss clinic, at 50, overweight and menopausal, I had turned virtually into an accredited member of the Yo-Yo Sisterhood. Seduced by an irrational promise of being able to shed 10 kilograms in six weeks, I’d signed up for an entirely suspect weight-loss program. Two days into it, I felt worse than I had ever done. My lower back and pelvis throbbed in acute pain, caused by the incorrect placement of high-frequency electro-muscle stimulator pads on tender body parts. A young thing with a badge – it described her as a ‘Councilor’ asked if I had any “depression problems with unhappy life”. Deadpan, I fed her a story of a fat husband who forced me to eat mountains of carbohydrates so that I could match him kilo for kilo! She wrote it diligently onto my chart, right beneath my marital status, which read: ‘Divorced’. On day five, the scale careened to a halt at 69.9 kilos. I was 14.9 kilos heavier than my post-pregnancy weight. I stepped off the shining industrial scale and ran to the bathroom. I took in the attractive face of a middle-aged woman. My once-svelte body resembled an uneven moonscape of cellulite in the full-length mirror. Furious at having wasted time and money, I raced home and buried my angst in a moist badami mango, dropping the second weight loss plan of the year. The dietician I had visited prior was a lithe diva whose flawless face and beautifully coiffed hair stare out from newspaper columns. She had tapped a red painted talon on my shoulder and remarked, “Your weight gain is a result of hormonal imbalance, overt emotionality and unchecked eating patterns. You’ve been neglecting your body and mind, right, b-a-b-y?” Mortified, I had lowered her eyes and shifted her gaze to the diva’s expensive stilettos, thinking, “Some women really have it all, fangs included!” Needless to add, I didn’t pursue her plan. Some days later, my man friend turned up at teatime. Looking proprietorially inside my groaning fridge, he said, “Hmm. I wonder why my wife and lady friend have both given up on themselves.” Something snapped. I smiled politely at him, put the thought of his toned posterior out of my head, poured his tea and refused to engage further. After he left contrite at the tasteless remark, I emptied the refrigerator with vengeance: bottle after bottle of sauces, creams and desserts all landed in the bin. Among other things I put away were overwhelming images of overweight grandmothers, an obese mother and beautiful but disproportionate aunts, all of who moaned endlessly about their wobbly bits for years. Weight, it would seem, was the family burden. Piya, a friend, an editor with a woman’s magazine, asked me to order a copy of A Course in Weight Loss by Marianne Williamson. She mentioned it just as we were about to bite into hot and spicy samosas ordered in to accompany fragrant milky tea. Almost every conversation I was having was about weight and how to lose it. I and, for that matter, every woman I knew, thought too much about eating too much, and talked too much about slow metabolic rates and menopausal syndromes. 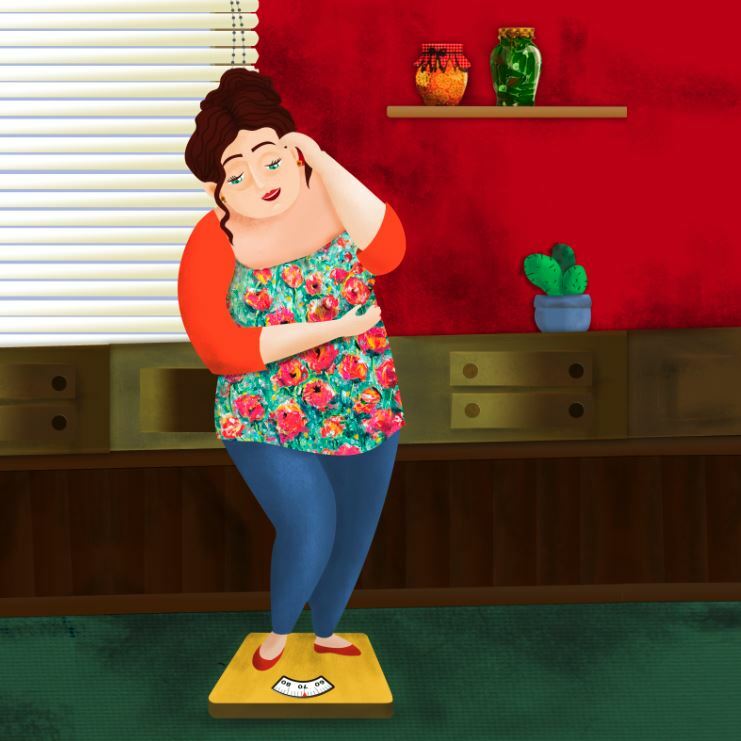 My weighing scale – it was the only constant in my life – sat strategically next to the refrigerator, casting a disapproving eye every time I opened the door of the fridge. After six months of abstaining I had a breakthrough. Over coffee, my friend Nyla suggested that I let the scale go. “If you keep telling yourself that you are 68 kilos, you will remain at 68 kilos.” It was as simple as that. ‘What you think, you become’ and ‘you are what you eat’ are two simple truths we overlook. From thereon I focused on nutrition and fitness. I tanked up on water, quaffed lime shots, ate soups and one-pot vegan meals, fruits and good carbohydrates. I ditched all diet foods. I followed just my inner guidance. My body intelligence was re-asserting itself. It’s fascinating to see how society uses relationship status and weight as a measure of success or failure. As if thin is the only way to be …as if, a relationship status can make or break you…. Not surprisingly though, when I dropped my own ‘weighty’ issues, the fat melted away. There are a million prescriptions to weight loss. Fulfilled women will however vouch that the most impactful shape-shifting agent is self-love. About the author: Born with a silver spoon, golden girl Venus is a bright and witty fifty-something, whose persona matches that of her archetype. A wordsmith by profession, she believes in saying it as it is. Cougar mommy, woman of the world, she is part diva, part agony aunt, who believes that her vulnerability is her strength. Her life’s mantra: Find beauty, purpose shall follow.